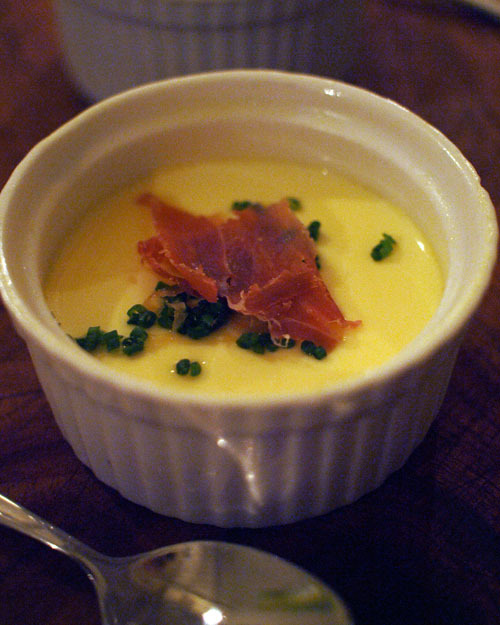 Above: Complimentary amuse bouche of savoury custard and crispy proscuitto. I love savoury custard and this one was soooo good! Silky, nicely set and still a little warm. Cured Salmon & Prawn: Horseradish emulsion, gooseberry cream, cucumber, trout roe. I loved the presentation on a piece of black slate – very striking. All the interesting textures made it very fun to eat! 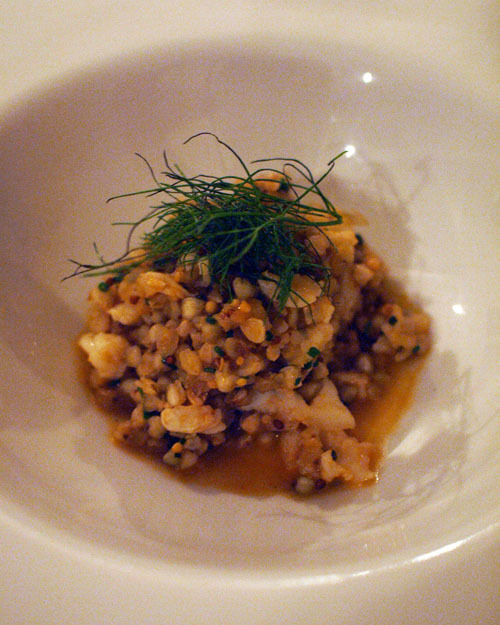 Queensland Spanner Crab: buckwheat, shellfish stock. Very generous amount of crab and the shellfish stock is rich and intense. Braised Bangalow Sweet Pork Belly: prawn tortellini, jus. 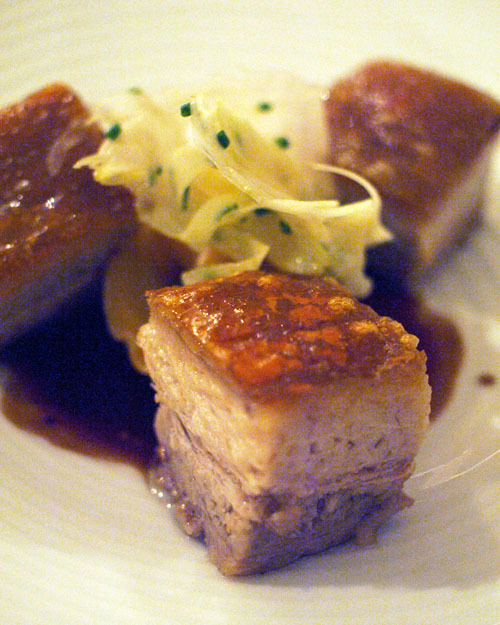 You cannot must not visit Bangalow without eating a generous portion of the beautiful locally reared pork. Whether it’s as bacon or gorgeous belly like this, it must be tasted to be believed! 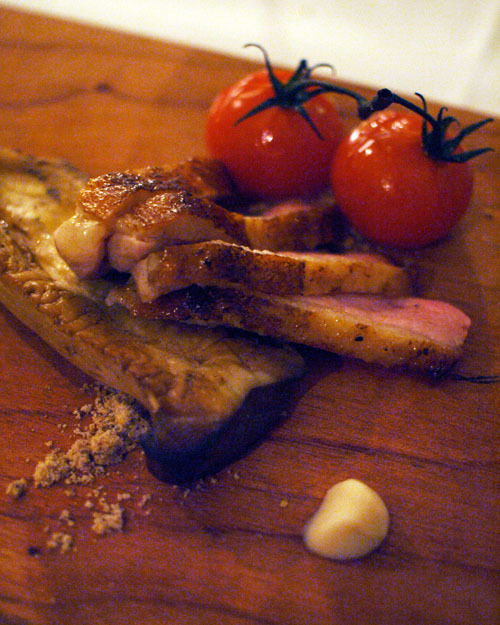 Brined Bangalow Duck: King brown mushroom, baby heirloom tomato, soil. There are few things better to eat than a perfectly cooked duck breast, yum, plus I love any opportunity to eat heirloom veggies. I’m going to try and grow some this year, fingers crossed. I felt this needed a cracker or some grissini to eat with it, but I’m old fashioned like that and fussy with cheese (which I love!). 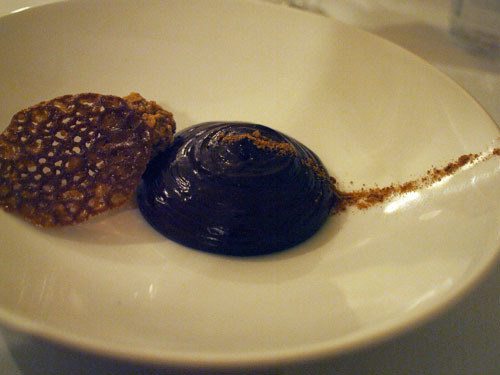 Hot Chocolate Bubble: hazelnut croquette, onion crumbs. The perfect sweet ending. 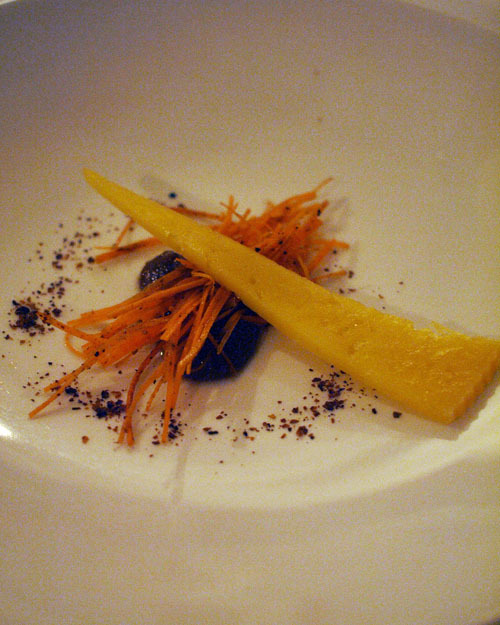 I love a chocolate course that is paired with a savoury ingredient like chilli, or in this case, onion crumbs. We waddled out of there full and happy. Rest assured we got a lift home after all the wine. Christie and Dillon dined as guests of Satiate. ← News + Upcoming Events! The pork looks very good and the prawn and cured salmon dish looks interesting. I wouldn’t know where to start eating this dish. If I am ever in that part of the country I might just need to drop by. What a wonderful degustation. It all looks devine, but yummo to the duck breast. 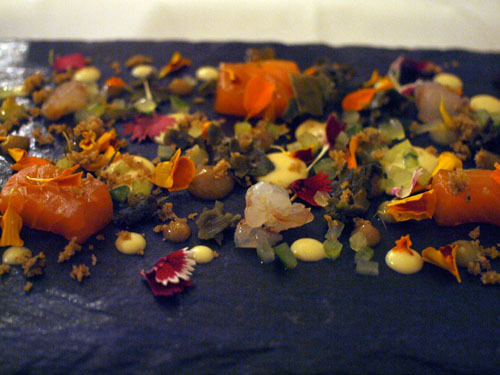 Loved the salmon on the slate, very visual. Looks lovely but is that a chip I can see in the ramekin in the first pic? Or just the angle? You cannot beat Bangalow Pork. I’ve been there, “Satiate Restaurant”, very nice ambiance and very delicious and unique dishes. Happy 2nd anniversary! I’ve had the same crab, buckwheat risotto and shellfish “bisque” dish at Sepia actually – wonder if the kitchen is/has the same talent? You know, my aunt lives and operates bungalows and a farmstay house in Bangalow…(and there’s macs and lemon myrtle there too!).. we try to head up every year :) August/September is my fave time of year up there..
Congrats on your second anniversary. I actually was proposed to on the muddy Brunswick river in Feb and we celebrated in Bangalow as well. Such a lovely spot. After hearing a couple recommendations of this place, my husband and I decided to go to Satiate for our 10 yr anniversary dinner. Our 5 course degustation started off well with delicious Amouse Bouche, Yellowfin tuna, Bangalow Pork and Duck. Then a series of events started to mar the evening. First, a gigantic cockroach was crawling around and settled near our table. Then a Christmas beetle landed in the middle of our table. This was humorous to start with, but then the food and service began to go downhill towards the last two courses. The dessert as written in the menu was “banana pudding”, which I was looking forward to, however we were served “cherry pudding”. When I picked up on the discrepancy, the waitress then said “yes, we changed it”. My husband and I thought it was odd not to have mentioned the change earlier but we didn’t mind cherries. So after polishing off most of the dessert, I noticed that my cherry had a big mould spot on it. When told, the waitress smiled, collected our plates and said “I’ll let the chef know” in an upbeat tone, as if we had just told her a compliment. No apologies at all. We asked about the cheese platter and she said they only had a washed rind. What?? Just one cheese for a “cheese platter”? So, we said we’d opt for the petit fours instead with tea/coffee. I started to pour the peppermint tea and noticed some brownish-looking plug blocking the spout. We fished it out with the pointy end of a teaspoon and it looked like a brown crumbly wet crouton. When notified, the waitress casually said “It’s probably a piece of ginger. Oh well these things happen”. I was dubious, as ginger doesn’t crumble or smudge like that and ginger tea, was not one of the limited herbal tea options she had mentioned. After 10 mins of waiting and no wait staff in sight, my husband and I got fed up and went downstairs to pay the bill. Thankfully, we weren’t charged for the petit fours, which saved an unpleasant confrontation at the end of what ended up being a memorable night for all the wrong reasons. Perhaps your review is best directed to a more conspicuous public review forum (e.g. Google or one of the Fairfax Good Guides, where these folks are listed), or the restaurant management, where they could better address your concerns? Thanks for your comment. Those guides you mentioned are great resources, but blogs are also a great public forum to express your viewpoint. You’d be surprised how many restaurants check blogs for feedback.